A Ockershausen:	Our guest today has been described by his colleagues as an incredibly nice person. Always willing to give advice, especially to young business people, I’m included in that. An amazing human being, a lovely lovely man. The Dudley Do-Right of the newspaper business. The rare mogul who puts principles and people ahead of profits. I’ve personally known Donald Graham for almost 50 years, throughout my career at WMAL, WMAL TV Channel 7, The Washington Star Group, which don’t exist anymore, but WMAL Radio’s still here thank God. I knew Donald when he was in school and when he was in the military and when he got out and his work with the city, but Donald, I’m so so so happy that you would agree to this discussion because you are a very big important part of Our Town. Donald Graham:	I’m very happy to be with you Andy, this is fun to talk about DC with somebody who’s been part of it as long as you and I have. Donald Graham:	This is great. A Ockershausen:	Which was the genesis for everything that we’re doing with Our Town. Donald Graham:	It’s a great idea. A Ockershausen:	You know, Our Town includes the suburbs, you know, we just don’t limit it to downtown DC, but it’s all Our Town and the fact is The Post was so important to everything that happened to Our Town over the last 75-80 years, it’s been just great. A Ockershausen:	People couldn’t understand it. A Ockershausen:	But, we were all about Our Town. That’s why we were successful. Donald Graham:	Yeah, you were, you had the most popular people and The Post. A Ockershausen:	The Post was Our Town and always was, I remember reading about when your grandfather bought the paper, it was pretty much on the rocks compared to the other papers. Donald Graham:	So, my grandfather Eugene Meyer, bought the Washington Post at a bankruptcy sale in June of 1933, so why was it bankrupt? Well, there were five papers in town. The Post was the fourth in circulation out of five. Star was the biggest, then there were The Times, The Herald, and The News. The post claimed a circulation of 50,000. 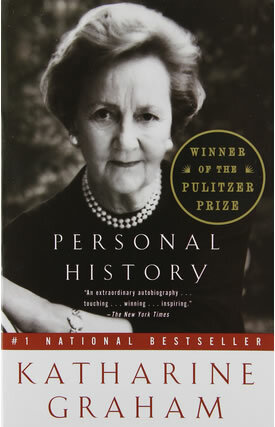 In her book. My mother wrote that she was skeptical that they had 50,000 circulation, but that’s what they claimed. It had this run down rattle-trap building on 1337 E Street, right where the JW Marriott Hotel is on Pennsylvania Avenue now. A Ockershausen:	Know it quite well, Basses Delicatessen or something was right there. Donald Graham:	Yeah, but they had no money, they were losing money every year. I knew a guy who consulted for Mr. Meyer back in the 30’s and said that Mr. Meyer told this consultant that he hoped the business would break even in three years. He would improve the paper, that would increase the circulation, maybe the advertising, it took him 21 years. He paid the losses out of his own pocket and he didn’t own any other business. He was a hell of a guy. He bought The Post, he was 57 years old. He had never run a business and he had never worked on a newspaper, but he made a lot of money on Wall Street when it was tough to make money on Wall Street and then had come to work for the … He was French, so when World War I broke out, good luck for me, he came down here to volunteer to work for President Wilson helping organize American business for the war and he stayed. A Ockershausen:	Well, he was part of Our Town Eugene Meyer. Donald Graham:	And then leaving office in 1933, The Post came up for sale and he bought it for $825,000. A Ockershausen:	That’s a spot on WTOP Radio, but at that time, that was the end of The Depression, correct? Donald Graham:	Well, it was the middle of The Depression, it was just terrible. Business was awful. I will tell you how broke The Post was, the photographer … There’s a picture of that bankruptcy sale that ran in The Post in June of 1933 and I knew the photographer who took that picture, Arthur Ellis, who was still on the staff when I came to work there in the 1970’s, and Arthur said that they sent him out to make that picture, they gave him one plate. A Ockershausen:	That’s all they could afford. A Ockershausen:	Is that the one he had the paper top? The paper hat? Donald Graham:	No, this was one … It’s a bunch of indistinguishable old guys wearing hats, standing on the steps. A Ockershausen:	Right, I remember the paper hats, the pressman wore those didn’t they? Donald Graham:	No, this was outside. They were on the steps and there’s an auction going on and the auctioneer is selling the Washington Post and my grandfather wasn’t there, the lawyer representing him was, but he bought it and lost a lot of money, but eventually turned it into a successful, profitable business. A Ockershausen:	Gold mine. Donald, but that was what your grandfather was dedicated to Our Town, to seeing it grow and prosper. He stayed the course, certainly got into broadcasting in a big way, down the road … I guess that was your dad that did that. Donald Graham:	That was my dad. He was … So, my dad was Gene Meyers son-in-law, married Kate Graham, my mother, whom you knew well. A Ockershausen:	Absolutely, wonderful wonderful lady. Donald Graham:	My dad was a genius, very bright guy, son of a dairy farmer in a very different Dade County Florida. A Ockershausen:	Was he married to your mother at the time? A Ockershausen:	When he came back from WWII. A Ockershausen:	I think I remember WOIC was the call letters. Donald Graham:	I think that’s right. A Ockershausen:	I remember Channel 9 certainly. Donald Graham:	Then he bought the TV station in Jacksonville, Florida which we still own, WJXT. A Ockershausen:	Well, he was such a bright bright man and so important to Our Town because he got involved and got the people involved. I know your dad was involved with business, but he was also involved with charity, he was involved with the Board of Trade, he was involved with the bank, he was all over the place. Donald Graham:	Andy, he was really the founder of the Federal City Council. He was a member of the Board of Trade, always, but the Board of Trade was very closely associated with the Washington Star. In fact, my mom always remembered that the Board of Trade used to meet in the Washington Star building. That was there home, so you know, my dad was from the South, but he was not a segregationist, he believed in equal treatment of people regardless of their race. The Board of Trade took the opposite stance. A Ockershausen:	I recall that vividly, and that was the Star’s position. It was a very slow learner and they were slow getting it. Donald Graham:	Yeah, and my dad and a bunch of other business people in town wanted a more open-minded, more inclusive business community and they formed the Federal City Council as a small group that would have influences for causes of a different kind and yeah, he very much believed in the city and believed in it’s future. A Ockershausen:	Our Town and with his great broadcast properties that became so important to the city and to Our Town, and still are thanks to you Donald. Donald Graham:	Well, you remember the broadcast team that Channel 9 and WTOP had back in the late 70’s under a guy named Jim Snyder, whom you knew well. A Ockershausen:	Very well, what a wonderful man. Donald Graham:	The Ben Bradlee of broadcast news and he hired the team that included Gordon Peterson, Max Bunyan, JC, Maureen Bunyan, Warner Wolf whom we remember. Louis Allen and people, a lot of young people including Andrea Mitchell who got her start there. Roger Mudd. A Ockershausen:	Oh God yes, and Roger, local guy, went to Wilson High School. Donald Graham:	Covered Montgomery County for WTOP first job. A Ockershausen:	Oh Donald, to hear those names is so important. Of course, you grew up in that atmosphere, you lived in the city. Donald Graham:	I grew up at 2920 R Street, my mother’s house in Georgetown, took the streetcar up to St. Albans, three cents. A Ockershausen:	Now, that house is still there of course? A Ockershausen:	Mark is a dear friend of ours and he’s gonna come onto Our Town, but you went to St. Albans so you could go streetcar, you could walk too, right? A Ockershausen:	But, you could do it? Donald Graham:	From R Street, you could. St. Albans in that day, had the policy that no matter how much it snowed, school was on. A Ockershausen:	All you need’s a heavy dew now. Donald Graham:	There were days you did walk, but that was a policy we all remember. Now they’ve got many more students who don’t live in DC, would have to drive in from Maryland, Virginia, so they have to take that into consideration. A Ockershausen:	St. Albans has become, I mean they’ve spent a lot of money on that facility Donald, and spent a lot of money on the tennis court, but you know, the story I heard about you is so important, that you played sports relentlessly. I don’t know where that code came from, but you were involved with baseball, wrestling, football, you did everything. A Ockershausen:	Relentless it said. Donald Graham:	The head of St. Albans, Canon Charles Martin, who was a big influence in my life and wonderful man, believed in studying, but he believed in sports just about as much. We used to pray on Friday’s in chapel that the football team would win. So, if you didn’t have a hell of a good excuse, you were gonna play three sports a year because Canon Martin was gonna see to it that you did. A Ockershausen:	And that was the big, very competitive Landon School, it was a nice rivalry, growing up rivalry. Donald Graham:	Had to read Shirley Povich columns about Landon all the time because the Povich kids went to Landon, so that was … Maury and David and these other good athletes in the Povich family. A Ockershausen:	The Shirley Povich story is so great, what is it 66 years with The Post? A Ockershausen:	He was not a big man either. A Ockershausen:	A mansion right? Donald Graham:	Union Station, he goes right up Massachusetts to Friendship, the McLean mansion, walks in the door, McLean says “Shirley, I’m so glad you’re here, we’re playing golf after lunch, this is my partner President Harding.” So, first day in town he’s caddying for the President of the United States on McLean’s private golf course which is at McLean Gardens. McLean then sends Shirley down to the Washington Post and says “tell the business manager I said to give you a job.” By chance, the business manager looks at this scrawny kid and sends him to the news room. Shirley said it was because he plainly thought he was good for nothing. Two years later Shirley’s the Sports Editor and writing and covering the only World Series Champion Washington baseball team in history, 1924. Shirley wrote for The Post from 1922 until he died, I think, in 1993. Might have been 1998 at the age of 93, and he wrote a column the day he died. It was a terrific column, too. A Ockershausen:	What made The Post so much more than a newspaper. Donald Graham:	Yeah, Shirley and Herb Block. A Ockershausen:	The kids growing up here, I mean. Donald Graham:	We loved our local teams, bad as they were. A Ockershausen:	Well, we loved The Post. Donald Graham:	And, you looked it up and those teams we rooted for in the 1950’s were just as bad as we remember. A Ockershausen:	We lived through it. You’re listening to Our Town with our special special guest, Donald Graham. We’ll be right back after this break. 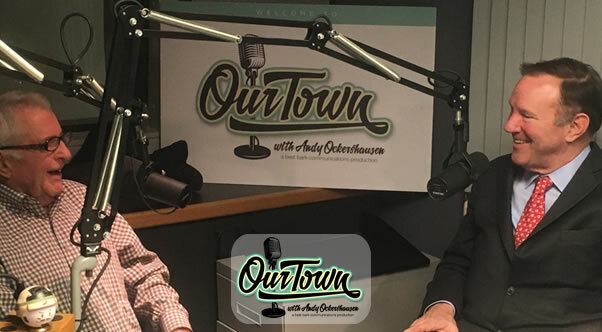 A Ockershausen:	This is Andy Ockershausen, this is Our Town and special special part of Our Town to have Donald Graham to talk about what his family has done for Our Town, it’s incredible, and what he’s done. I remember when his story was Harvard, and he graduated from St. Albans playing all the sports and went to Harvard with Bo. Donald Graham:	Yeah, Bo Jones was two years behind me. Donald Graham:	Bo later became the publisher of The Post, but he was two years behind me at St. Albans, went to Harvard, became a Rhodes Scholar, which I definitely did not and then became editor of the Harvard Law Review, which is pretty good and then, by great good luck, came and was the editor. A Ockershausen:	And you were the editor of The Harvard Crimson. A Ockershausen:	That was one of the foremost college newspapers in America in it’s day, is it still? Donald Graham:	Yeah, it’s a terrific paper, there’s a lot of good college newspapers in America, it’s a great source of strength for journalism. A Ockershausen:	That’s true. It’s a daily. Donald Graham:	Yeah, six days a week. A Ockershausen:	The Harvard Daily, and that launched you into the career in newspaper business, so when you came back after the war, I mean after your college, you went to war, you didn’t go back to the newspaper. Donald Graham:	Well, I got drafted Andy. A Ockershausen:	I remember that. Donald Graham:	You and I know what … I am something called a draftee and if you talk to people in their 20’s and 30’s you have to say “let me explain to you what that was”, but I was … I graduated from college and then I was drafted and served one year in Vietnam with the First Air Cavalry Division and thank the Lord, came back in one piece. A Ockershausen:	Right. An experience you’ll never forget, being a part of that group the First Air Cav. A Ockershausen:	Don’t go for it. A Ockershausen:	In our peer group, yours and mine. You’re somewhat younger, but everybody served in some way or another, you know? I was in the International Guard, we were put on active duty for Korea, so all that happened in those days and now it’s … You know, I don’t know anybody in the military anymore like I used to. Donald Graham:	I know a few who are the children or grandchildren of friends, but it’s … I so admire the people who serve. Those of us who served in Vietnam, served one year, the difference now is if you’re in the military, you get sent back over and over and over again. A Ockershausen:	Isn’t that amazing? Four or five deployments. A Ockershausen:	They’re on airplanes so much, they must get mileage. A Ockershausen:	I know, it’s terrible Donald. Donald Graham:	It’s too much to load on. A Ockershausen:	But, you came back from the war and said “what can I do for Our Town” and you joined the Police Department. Donald Graham:	Yeah, so I was a patrol officer in No. 9 Precinct in northeast Washington from January of ’69 to June of ’70 and again, I served with such a great group of cops and I’m so glad I did. A Ockershausen:	What an education, to be dumped into the city, well the channel. Of course the No. 9 now is a much better precinct than it was then. Donald Graham:	Well, it was a rough old place in 1969 and it’s a very different place today. The Atlas Theater in 1969 was not the Atlas Theater of today thanks to Jane Lang. Donald Graham:	Well, we walked H Street. That was the focus, 15th and H was sort of the focus I had the scout car beat that ran from 15th and H, up the hill on Maryland Avenue with Bladensburg on one side and Benning on the other. A Ockershausen:	Oh, my names Donald, that’s my neighborhood. I grew up in the northeast. Donald Graham:	Hechinger’s Mall was right there, the headquarters of the Hechinger Company was right there on 16th Street. No, Giant was not there. There was a Safeway at 16th and Benning. I don’t think there was a Giant in No. 9 in 1969, this was a time, you remember and I remember, when there was a heroine epidemic in Washington and therefore a crime wave and robberies were taking place, you couldn’t believe it. A lot of the convenience stores had to close up, they were just robbed so often. A Ockershausen:	They couldn’t operate. But that was still a great experience to know the city, know the people. Donald Graham:	It was terrific. A Ockershausen:	I’m sure you made names and friends then that are still in your life one way or another. A Ockershausen:	And that was great, and a lot of people don’t realize that Donald, that gave you a new, a prospective on this city and what it is and what it can be. A Ockershausen:	What it is now, it’s incredible. Donald Graham:	And we’ve seen it go through tough times and we’ve seen it go through good times and it’s basically, it’s a great place. A Ockershausen:	All those names that you mentioned are all in part of my life from all over, I remember Kahn’s, Hecht Company, Lansburgh’s, you know, that was part of what we were. Donald Graham:	It’s only the older folks who remember Kahn’s and Lansburgh’s, but the Hair Company was a part of our life for a long long time. A Ockershausen:	That’s true, and it’s still around thank God. But Donald, how did you get so deeply involved with the newspaper, you worked your way up within the paper. A Ockershausen:	I recall one time when you were titled as a Sports Editor, was that a fact? A Ockershausen:	A city reporter? Donald Graham:	City reporter, but the problems at The Post were not in the news room. I joined up in January 1971 after about a year in the news room, I went to work in the circulation department, then in the production department, advertising department and the problems of The Post as my mother wrote in her very good autobiography, were on the business side. Labor relations were tough, but yeah, I became … Bradlee, Ben Bradlee, the Editor of The Washington Post and a great great man, you know, my mother was one of the highest ranking women in American business. To say that she was unsure of herself is a gross understatement, she went through life telling people she was not up to the job, she was scared, and all the while she was doing just an incredible job. A Ockershausen:	She was doing great. Donald Graham:	One of the greatest things she ever did was to make Ben Bradlee the Editor of The Washington Post in 1965. Ben had been the Washington Bureau Chief of News Week and had once been a crime reporter on The Post when the leading lawyer in DC was Edward Bennett Williams and Ben covered Ed and they became the best of friends. A Ockershausen:	He made Ed Bennett Williams a household word too, from The Post, I know that. Donald Graham:	Ben had a little problem in the Sports Department, not worth going into here, but he asked me to go back there for a year, run it and pick a successor who could run it on a permanent basis and luckily for me I tripped across George Solomon who was an obvious successor and Sports Editor for the next 25 years. Donald Graham:	George had enough ideas for sports stories that he could have run five sports departments. He had ideas about who could write and he had ideas about which reporter could execute which story, he was just a tremendous editor, hired Kornheiser, Wilbon. A Ockershausen:	Oh my God, it was like “We The People”, the whole staff was fabulous and females, don’t forget Christine and Liz Clark. Donald Graham:	Going all the way back, Joan Ryan, Nancy Scannell we had some of the first African-American and female sports writers in the United States. A Ockershausen:	Way ahead of your time Donald. Donald Graham:	But, that was all George. A Ockershausen:	George worked for The News before he came to you, I remember I first met him when he was a writer for The News. Donald Graham:	He did, and he also had a magic touch with interns. George would hire kids, he hired Mike Wilbon as a Junior at Northwestern as a summer intern. Donald Graham:	David Aldridge, Mark Maske, The Post is full of people today that George hired as summer interns. John Feinstein, imagine hiring Feinstein? A Ockershausen:	And, then the war began. They didn’t start fighting till they started working with each other, I don’t think it ever ended. Donald Graham:	You’ve talked to George about that, you don’t need me. A Ockershausen:	I do, George was with us and told us everything. I work with him from time to time on his deal out at Maryland, at Merrill School, which he does a great job. Donald Graham:	Oh, good for you. A Ockershausen:	Donald, it’s so great to hear you talk about these names, they’re all so important to Our Town. A Ockershausen:	All the Graham’s made that happen. A Ockershausen:	You hired George, you’re to blame for George. Donald Graham:	I will take the blame for George. Donald Graham:	That was me and there’s no doubt about it. That’s one of the things I’m proudest of in my whole career. The other thing was I put Tom Boswell on the baseball beat in 1973, he’d been covering high schools and that was … Tom is, boy talk about somebody who’s part of Our Town. That’s somebody that bleeds Washington. A Ockershausen:	I met him when he went to St. Stephens. How long ago was that? Donald Graham:	Yeah, and he bleeds Washington sports. He watched all those lousy teams just like you and I did. A Ockershausen:	I know, he’s so happy now he’s got something to write about. You know Ben Bradlee was such a big important part of Our Town and important to me because, for some reason, he took a liking to Ken Beatrice, I don’t remember why. Donald Graham:	Well, Ben was a huge sports fan. He used to go to every Redskins game and sit in Williams’s box, his best friend, and this was in RFK days, but I went as long ago … Did you go to Griffith Stadium? Did you see Redskins there? Donald Graham:	Yeah, I saw Sammy Baugh last year. A Ockershausen:	I work with the name that you may remember, Jim Gibbons. A Ockershausen:	Was a morning guy and I was working for Jim and Harry Wismer was . . .
Donald Graham:	Well, I remember those two as part of their audience, but they were good. A Ockershausen:	Absolutely, they were part of Our Town. Donald Graham:	I loved listening to it, loved it. But, the teams were really bad, I mean they went through whole years they didn’t win a game. A Ockershausen:	But, they were colorful, remember George Marshall and the band and he did all these things. Donald Graham:	The band was good, the football teams, not so much, although you know, we rooted for them, we were happy to be there fans. A Ockershausen:	Well, Donald we’re gonna take a break here and then I’m so so delighted that you’re bringing up these names because this is jogging memories of people we gotta get on Our Town that are still with us. A Ockershausen:	This is Andy Ockershausen and with Donald Graham. [Commercials] Attorney Mike Collins:	Are you still promising your spouse to get your will updated and a good basic estate plan in place? Are you finally ready to make sure that you don’t leave a mess behind for your family to clean up? Give me just two hours and I’ll show you how. I’m Attorney Mike Collins, host of radio’s legally speaking show. Come to my seminar and I’ll teach you what you need to know about wills, trusts, taxes, probate, how to keep your money in your family. Register now at mikecollins.com and I’ll even waive the tuition. That’s mikecollins.com. A Ockershausen:	It’s Andy Ockershausen, we’re talking to Donald Graham about his career and it was terrific, and the people that he hired and the people he worked with, and Donald listening to you talk about Our Town gives me so many ideas of people we want to bring back and not bringing you back here I could actually active all the time. My involvement with Heroes began in 1964 with Bud Doggett and you know about that and what they’ve done for the city and what Cherrie has carried on. Donald Graham:	There’s a name from the past. A Ockershausen:	Never wanted to. Donald Graham:	Never advertised … Right. But, by God, when a DC police officer or a suburban police officer or firefighter or an FBI agent was killed, they were there for that family, not just for that day or that week or that year, they were there as long as the children were in college, they helped pay the bills, they provided financial counseling, it is a magnificent organization if you want to do something for Washington, look up Heroes Incorporated and give them a little money. A Ockershausen:	And you know Bud funded the whole thing, Heroes never spent a dime, it was always Bud’s money that did all the groundwork. Cherrie’s carried that on. Donald Graham:	Yeah, he was … Those two people, the Doggetts are sensational people. A Ockershausen:	And the city responded to them. I know that Walter Washington and Bud were like buds. Donald Graham:	Well Mayor Washington was a crucial figure in the history of Washington DC. Donald Graham:	Just a fantastic leader. A Ockershausen:	His timing was excellent, what he did, what the city went through and what we all needed somebody like Walter because he was the … He brought people together. Donald Graham:	He was smart as can be and he was a man of enormous decency. His wife was a Principal of one of the high schools in town. Donald Graham:	Yeah, and the two of them provided leadership at a crucial time, when we were taking over our own government and he became our first Mayor. A Ockershausen:	Well, he was appointed first and then he won election, I lived through that. Donald Graham:	That’s right, he won the first one. A Ockershausen:	Whatever I did, I did with Bud Doggett and when Doggett said something, we all hopped because it was good for Our Town. Donald Graham:	Heroes Incorporated, there isn’t one of these in every city. It’s a Washington special. A Ockershausen:	No, it is special and they’ve tried to do it in other cities, but I don’t know if they’ve got the impetus like we have. Donald Graham:	I hope they do. A Ockershausen:	I do too Donald, we need that. Donald it’s just been so special to have you and I mean that. I’m not patronizing you, you’ve been a friend for many many many years and never tried to hire me. Nobody at The Post ever wanted to hire me. A Ockershausen:	From Northeast Washington. Donald Graham:	So, let me remind you of another name, I just visited the other day with Vincent Reed the former Superintendent of Schools. A Ockershausen:	Wow, love him. Donald Graham:	Vince is now, unfortunately he’s had a bad stroke and isn’t well enough to come on Our Town, but Vincent was for my money, just the greatest School Superintendent Washington had and along with his great friend and ally Floretta McKenzie. A Ockershausen:	She was great. Donald Graham:	In the 70s and 80s, but Vince came up through our own school system. He was the Principal of Wilson High School and he was so basic, so focused on improving reading and math. Teaching the kids what they would need to know for their education and when Vince, Vince went head to head with some of these elected school boards of his day, which were full of very challenging people and he … One of the things he pushed was the creation of Banneker High School, our college prep high school, where you have to take a test to be admitted and where 100% of their seniors, year after year after year, go to college and perform excellently. So, Banneker in a way, is a great living memorial to Vince Reed and is the best example of his brilliant work. A Ockershausen:	Well, you know, he put on some weight and I used to kid him about that, I said … You know he was quite an athlete growing up of course, but I said “Vince, you got too much weight on you”. Donald Graham:	He was the captain of the football team at West Virginia State and a boxer I think and looked it. A Ockershausen:	Oh, he was a great athlete. But, I will try to find him. He was so special in Our Town. Donald Graham:	Yeah, Vince is unfortunately not well enough to come on the program, but he’s a great great man. A Ockershausen:	Donald, every time we wanted to win a vote, you’d get The Star employees and The Post employees to vote, you could elect anybody. Donald Graham:	And they elected you. A Ockershausen:	And they elected me and Charlie Brotman, don’t forget that. Donald Graham:	Love Charlie. You and I are old enough, we heard Charlie announce the Senator’s games at Griffith Stadium. A Ockershausen:	How about that, and they were great. I love Griffith Stadium, it’s a hospital now of course. Donald Graham:	Well, you know, you could sit in the stands and there was the Wonder Bread Bakery outside the left field fence and you could smell the bread baking in the afternoon. A Ockershausen:	Wasn’t that great? Donald Graham:	I remember you mentioned when I came in the name of National Bohemian beer which advertised on the right field scoreboard, they had a bottle that stuck up above the right field fence and I remember watching one night when Yogi Berra hit a ball over the fence, but it hit the neck of the beer bottle and bounced back in for a double and whoever was announcing the game on TV really enjoyed that. A Ockershausen:	Bob Wolff probably. Donald Graham:	Probably, Bob Wolff, Arch McDonald. Donald Graham:	Did you really? God. A Ockershausen:	Yeah, and we’ve done so many people from The Post and we got more coming up and Donald I can’t thank you enough. You are such an important part of Our Town. A Ockershausen:	The Post is our life. Donald Graham:	Yeah, I love talking about Washington with you. A Ockershausen:	I know you do. We’re gonna supply you with Maurice Cullinane’s phone number and his email address. Donald Graham:	That’d be great. A Ockershausen:	He’d love to hear from you. Donald Graham:	Thanks so much. A Ockershausen:	Donald, thank you so much and for Our Town, this is Andy Ockershausen and we just enjoyed this so much. Donald Graham:	Yeah, thank you so much for the chance to be with you. A Ockershausen:	I’m hopping up and down, thank you Donald. Announcer:	You’ve been listening to Our Town, Season Two. Presented by GEICO, our hometown favorite with your host Andy Ockershausen. New Our Town episodes are released each Tuesday and Thursday, drop us a line with your comments or suggestions. See us on Facebook or visit our website at ourtowndc.com. Our special thanks to Ken Hunter, our technical director and WMAL Radio in Washington DC for hosting our podcast. And thanks to GEICO, 15 minutes can save you 15% or more on car insurance.